In honor of National Volunteer Month, here’s a mental exercise. Picture a volunteer in your mind: What is that person doing? Tutoring a child? Removing buckthorn from a preserve? Stuffing envelopes? What about de-duping your database or teaching your staff to build better slide presentations? Those may not be the first tasks to come to mind, but they can be great tasks that mutually benefit skilled volunteers and your organization. Building a PowerPoint theme with Idealware branding. Getting guidance on how to keep our Google AdWords Click-Through Rate above 5 percent. Optimizing page layouts in Salesforce. 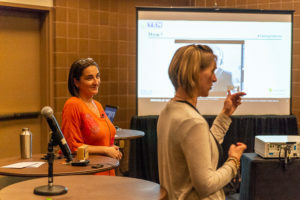 Along with Peggy Duvette, Oracle Netsuite’s Senior Director of Social Impact, I presented a breakout session on this topic at the 2018 Nonprofit Technology Conference in New Orleans last week. The session was specifically about using pro bono to better leverage free technology. Many tech companies offer product donations to nonprofits—some, like Oracle+Netsuite, pair these with pro bono support to help nonprofit clients implement, learn, and leverage the software to better support their operations. Where Can You Find Pro Bono Volunteers? Even if a vendor doesn’t help connect clients with pro bono resources, there are lots of ways to find skilled volunteers on your own. Organizations such as Taproot, Catchafire, and Volunteer Match offer matchmaking services that pair nonprofits with skilled volunteers, or you can ask board members or friends of the organization to refer people. 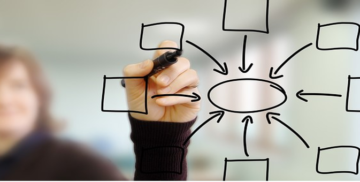 Specify the desired outcome and timeline for the project, in writing. Be clear on what role will be played by the volunteer, whether it’s an expert advisor, extra pair of hands, hands-on problem-solver, or something else. What decisions can they make on their own? What needs your input or approval? 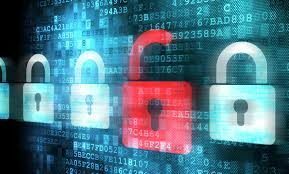 Are there privacy or security considerations? Understand what support from you will be necessary, and make sure you can commit to that. 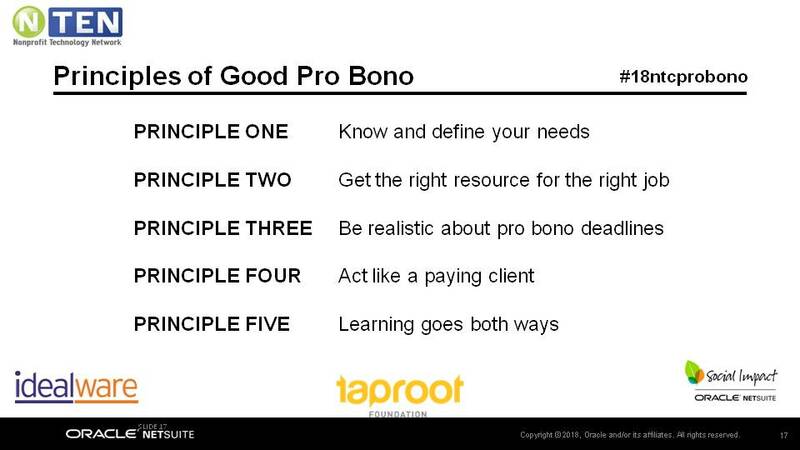 Don’t make the mistake of accepting offers of pro bono support that you don’t really need. Managing pro bono projects is a lot of work—and it’s well worth it—but only when the interests of the skilled volunteer and the organization are aligned. Consider keeping a few “someday” projects in your back pocket so that, when a well-intentioned person offers you their expertise (or their hairball idea), you can steer them toward something that will have a truly positive impact on your organization. Once you do have a promising project and a well-developed scope, look for volunteers who have the right knowledge and skills for the project. It sounds like hiring a consultant, right? It’s very much like hiring a consultant—except instead of monetary compensation, your pro bono volunteer is getting some other kind of compensation or reward. You’ll want to know what’s in it for them. What are they hoping to get out of this engagement? How can you make sure that happens? I’ll leave you with this slide. It’s a good summary of best practices for scoping a project, securing pro bono volunteers, managing the project, and celebrating success. If you’re a nonprofit on a budget (and aren’t we all), maybe you’re investigating or using donated software. 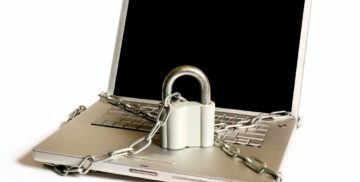 Don’t overlook the opportunity for donated expertise to help you get the most out of that software donation. Pro bono projects, when well designed, can multiply the impact of free technology. Special thanks to Peggy Duvette of Oracle Netsuite and Elizabeth Scwan-Rosenwald of Taproot Foundation for designing the breakout session and for their leadership around tech pro bono.